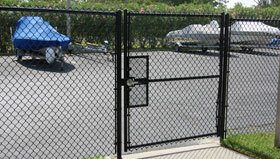 Gold Coast Shutter and Fence is ONE OF the premier chain link fence contractor in South Florida. Chain link fences are not what they used to be. Today’s South Florida communities require chain link fences with much more curb-side appeal. As a result, the chain-link fences produced today come in various colors, styles and designs that enhance the appeal of chain-link while still keeping it a great economic choice. Modern color-coated chain-link fences are designed to enhance landscaping and lessen the visual impact, normally associated with a fence. Choosing a vinyl coating provides the landowner with an attractive, secure border without detracting from the beauty of your landscaped yard area. A professionally installed fence provides security for a residential or commercial property and with the different styles, colors and designs available it is the perfect solution for most yards. 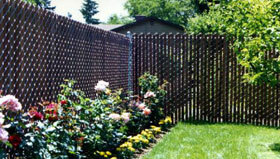 Today’s chain link fences can be appropriate for many different residential and commercial applications. By offering economical material and installation costs, Gold Coast, the foremost chain link contractors in South Florida, has made chain link a practical fence solution for enclosing and securing backyards, sports fields, swimming pools, kennels, playgrounds and wildlife barriers. 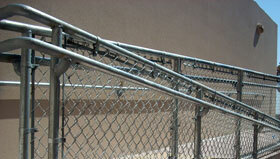 From 4' high dog runs to 30' high warehouse enclosures, there is a chain link fence for any application. Residential grade chain link fences come in galvanized steel, green or black vinyl coated chain link in 4', 5' or 6' fence heights, which are all in stock, to expedite your installation. For commercial and industrial locations where security is an overriding primary concern, heavy-duty frames and fabric in either galvanized or vinyl coated finishes are available. 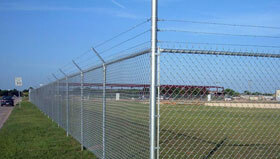 Barbed wire and/or razor wire may be used as additional deterrents, while slats or windscreen may be added. We also manufacture any size gates in our fabrication shop to match the chain link fences design in height, color and material. Swing gates, either single or double swing, roll gates and cantilevered slide gates are all produced by our professional craftsmen to your exact specifications. We specialize in replacement or repairs of all chain link fences, from dumpster enclosures to churches, day care centers, dog kennels, schools, post offices, sports complexes, warehouses and industrial complexes. 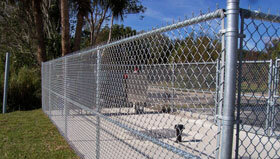 Call us today for an free estimate on chain link fences, In Broward County call: 954-472-7766. In Palm Beach County call: 561-395-5530 and in Miami/Dade County call: 305-480-5885, for a FREE ESTIMATE. Call Gold Coast Shutters and Fence today and save thousands. 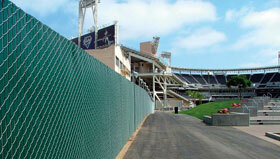 We are your one stop shop for all of your chain link fence needs.